Visualizing FLU Data with Wearables « Adafruit Industries – Makers, hackers, artists, designers and engineers! Todays wearables show dramatic shifts in health stats when one gets sick. There are five metrics which we can observe to see when we are coming down with something. This can be particularly helpful when deciding between going out for a stressful workout versus sleeping in to maximize recovery. There interesting stats to look at are based around heart data, sleep and body temperature. Specifically these five values. These charts were generated using the first generation Oura Ring and Garmin Vivoactive 3. Starting with Resting Heart Rate this number is calculated by the Oura Ring as your lowest heart rate detected overnight. While my typical values are in the mid-40’s to low 50’s when I caught the flu my resting heart rate peaked at 67. That is nearly 20 point beyond my normal level. 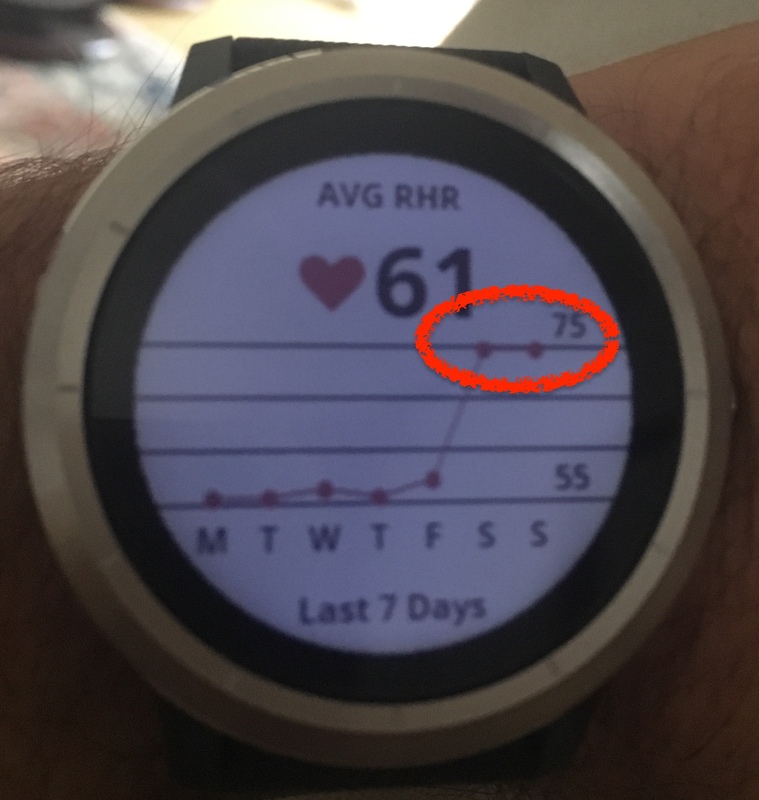 Fortunately, I don’t need to sift through my night time data to see this as modern smart watches with optical heart rate monitors will show this data through out the day. Resting heart rate while sick with the flu (67). Lower is better. Normal resting heart rate (45). Garmin Vivoactive 3 weekly resting heart rate average. Note that Garmin is using average weekly not “lowest” so these values differ slightly. HRV is currently the most popular single value to measure readiness. A higher number generally one in the 40 – 60 range is typical for me and indicates that it is okay to really push on todays workout. This HRV score of 17 was taken during the peak of my flu. It is the lowest score I have ever seen. I felt miserable all night and the following day. This HRV score of 51 was taken just two days before contracting the flu. This is a typical score for me and I felt terrific. Our body temperatures have a natural set point which rarely varies. The most I’ve seen for myself is about .5F of a degree on a typical night. This can be related to room temperature or an open window. However, when I contracted the flu my body temperature deviation jumped up to +4.7F. Stress level with the flu. Most of the day was medium to high stress with only 5 minutes at rest. Stress level on a good day has over 6h of rest and less than five hours of medium to high stress combined. Here is what a terrible night of sleep looks like. 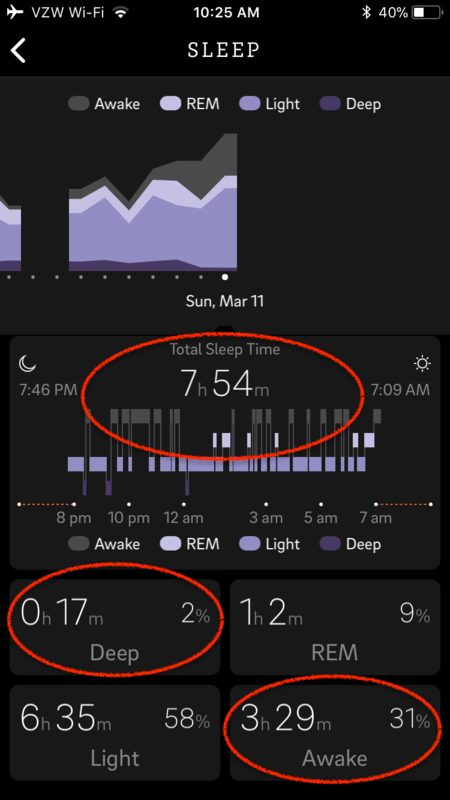 Notice that deep sleep was only 17 minutes (normal for me is 90 minutes) and I was constantly waking up. Nearly 3.5 hours awake.